My, how the Peregrine has changed! Once known for being a reasonably light, low to the ground, protective well treaded race machine, the Peregrine 8 has been completely revamped with a visibly different upper, thicker midsole and a reconfigured outsole. It feels a little bit heavier in the hand gaining approximately 1.4 oz/40 g, and I was uncertain as to what to expect with these updates, but was optimistic, as the Peregrine has improved notably each year since I began using the Peregrine 5. The upper has been improved dramatically, having removed the TPU overlays found on version 7 and instead features a more open, engineered mesh for added breathability and FlexFilm overlays on top of a panel style wrap (similar to IsoFit) for improved structure, comfort and support. The toe bumper, though moderate, seems substantial enough and is a slightly more substantial than the previous version. Fit is similar to the previous version, true to size with a secure performance feel. I found the Peregrine 7 to have a little bit of excess material vertically in the toebox, but that has been fixed with version 8. Overall this is a somewhat narrow shoe, even for my narrow, low volume foot, which fits me well, but the upper has just enough give as to not feel constricting or confining (though I don't have too much leeway). The tongue is gusseted to improve fit and keep the tongue in place. The woven laces integrate well with the eyelets and provide great snugging, though I did have to re-lace several times to find tension that was not too constricting. The tongue is also plush and very well padded, perhaps a bit more than necessary. The heel collar is also very well padded and cushioned. Heel hold, height, comfort, protection and stability are all very good. Side by side with the Peregrine 7 (left), the upper has been notably re-designed. There is a lot more open mesh, which improves airflow and has a little more give, without compromising security. The Peregrine 8 retains the full length Everun topsole for great cushion and response, but the EVA has been upgraded to the more premium PWRFOAM compound for a more fogivingly cushioned feel. I found cushioning the Peregrine 7 to be firm but adequate for the purpose of the shoe (shorter, more technical fast runs), but the addition of the PWRFOAM and the 2.5 millimeters more of it, bumps this shoe into the "all day" category for me, while retaining response and agility. One of the main draws for me in any version of Peregrine, has been the deep and aggressive lugs that provide very good traction in most conditions, especially, loose, off trail conditions. The Peregrine 8 builds upon this with a revised lug pattern that features super toothy 6mm lugs and an improved rubber compound that is stickier and adheres better, particularly on dry or wet rock. Additionally, the (extremely stiff) rock plate that was so obvious in previous versions has been omitted. Given the rocky trails I run almost exclusively, I am usually cautious of shoes without a rock plate, but increasingly, these concerns are becoming unwarranted with improvements in midsole materials and thickness, coupled with more sturdy outsoles with thicker lugs. In the case of the Peregrine 8, I do not miss the rock plate whatsoever and find that protection is equally good or better, while improving forefoot flex which improves agility and contours over rocks and rough terrain better. Traction is about as good as you can get in loose junk, steep off trail, scree, etc... and is also pretty good in the snow. A recent run in mixed snowy/icy/slushy/muddy conditions was very encouraging, as the Peregrine 8 stuck very well to most of it, all but the most hardened water ice, where only metal spikes would have a chance. Compared with the Peregrine 7 (left), both have very aggressive lugs, but the Peregrine 8 has superior tread. The Peregrine 8, though heavier than the previous versions, is a far superior shoe for my day to day runs. 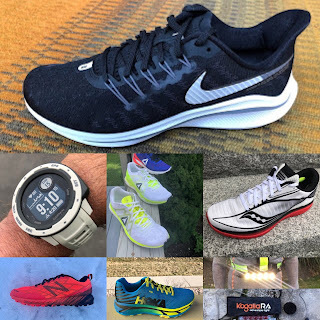 Most often, I typically gravitate toward more protective/cushioned shoes, with traction, but they also have to be at a reasonable weight and agile. The Peregrine 8 has all of those things. The more breathable, but still secure upper, combined with a more compliant and more cushioned midsole for longer runs, better flexibility and better traction is a winning combination. The Peregrine 8 runs surprisingly light and is fast, responsive and agile, great for fast runs in technical terrain and now with the improved cushioning and would be a great shoe for just about any distance, up to all day adventures (though for all day outings, one with wider feet may look for a little more wiggle room in the forefoot for swelling and long term comfort). Saucony Peregrine 8 vs. Salomon XA Elevate (RTR review here): The XA Elevate was my favorite shoe of 2017 because of it's all around performance, versatility and value. The Peregrine 8 is slightly more limiting with it's massive tread and tighter fit, but if your foot fits the Peregrine 8 and you are looking for maximum traction and slightly a slightly more cushioned feel, the Peregrine 8 is very worthy of consideration. Saucony Peregrine 8 vs. Hoka One One Speedgoat 2 (RTR review here): Not quite in the same category, but both very capable trail shoes for long distance and tough terrain. Traction is superior with the Peregrine 8, fit on both is fairly similar. Of course the Speedgoat 2 has better cushion, but the Peregrine 8 is very cushioned and protective in its own right. 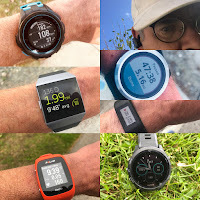 Saucony Peregrine 8 vs. Saucony Peregrine 7 (RTR review here): Long time Peregrine users will be somewhat skeptical of the added weight, 1.4 oz or so and cushion/stack height, but I would say to give the Peregrine 8 a chance, I think it will be a pleasant surprise. Saucony Peregrine 8 vs. Saucony Xodus ISO (RTR review here): The Peregrine 8 is creeping up on the Xodus in weight, but is a completely different shoe. It is much more responsive and agile than the Xodus, with better traction and comparable cushion. The Peregrine was provided at no cost. The opinions herein are entirely the author's. I find the peregrine 8 comfy for my wider feet. Supportive upper but not too tight, in any event roomier than the Speedgoat. No hot spots/blistering, breathable. I represent Salomon road/trail run socks in the US. We would love to get you some socks to review on your website can you please email me at jamie.sabuda@sportsdispatch.net so we can make the necessary arrangements? Thanks for the review. So far I'm really happy with this shoe for all the reasons you mention. Its technical and agile, but also smooth and cushy. The isofit panel makes for a close fit without chocking your foot. On that note, I've found that the forefoot fits a lot better if I start the laces on the second hole up where the isofit starts. That way I get a great midfoot fit, and the toebox feels decently wide. Also, I'm most often an 11.5, as with previous peregrine's, but I'm happy I sized down. 11.5 would have been too long. One of my favorite trail shoes I've tried out of the box. Thanks for your comment and tip. Anon, interesting. I have a somewhat narrow, low volume foot and find the Speedgoat 2 and Peregrine 8 fit me well and similar, but the Peregrine 8 does indeed have a bit more of a pliable upper with more give to it. Serge, thanks for the feedback. A great shoe indeed! I still prefer version 6. Much breathable without the isofit system which prevents air passing through. The more aggresive outsole is a welcome improvement. I wonder how Saucony managed to make a much heaver shoe since they removed the rockplate. Heavier and narrower - no thanks. It will be back to Altra for me. Looking forward to review of Altra Lone Peak 4.0. I will be adding my first impressions to Jeff's review shortly. I did not run the Peregrine 7 but can say that the 8 is in no way a narrow trail shoe. In fact I think it has more toe room and far better overall foot than the Altra Lone Peak 3.5. The front upper and overall upper is soft so absolute width is only one factor to fit and comfort. Hi. Do you think that it is a good shoe to run over 100 km ? They have enough cushion and protection, so I guess it depends on fit and terrain (if you really need that much lug). Hi, I have two multi terrain 50 mile ultras later this year which will include hard packed tracks, woodland paths, hills, soft grass and some mud. Would these be good for that distance and terrain or would I be better going with something like the Akasha? Love to know if this is a good soft cushion shoe or is it firm as I read in your review that there is good cushioning. If you compared this to the Adidas Supernova ST would it be similar or with the Adidas feel softer? Thanks! How would you rate Peregrine 8 on door-yo-trail performance / paved roads vs Salomon XA Elevate? Anyone got any comparison on the V6 V7 and V8 fit wise? I have V6 in a 10 and they fit fine, I tried V7 in a 10 and length was fine (i like it snug)but my little toe was crushed and sore after walking 5 mins in them. The mesh and overlay in that area look similar to the 6 in the 8 but really don't know what size to try? Unfortunately nobody stocks the bloody things anywhere near where I live. All Nike, Brooks and NB. Great review as I finally decided on the Peregrine over the Salomon Sense Ride and XA Elevate. All nice shoes but the cushioning and lower drop did it for me. Thanks for a great site. I also miss the breathability and fit of Peregrine 6. Anyone have feedback on fit? 5+6 were ok for mein a 10. 7 was too tight on the little toe I think mainly due heavy overlay. Don't want sloppy as I like snug but not painful so considering sticking with 10. The Peregrine did mewell during a Sparten Super OCR,great grip on the trail,obstacles and it drained well. Great news! Glad they worked out. Unfortunately, I have not run in a Kinvara in many years, so I couldn't even venture a guess at this point. The Peregrine 8 is now being replaced by the Peregrine ISO, which we are still hoping to review, but the ISO should have an improved upper and they are available now.